Caring Transitions of South Central Kentucky serves Bowling Green, Franklin, Scottsville, Morgantown, Glasgow, Beaver Dam, Greenville, Leitchfield and the surrounding areas. 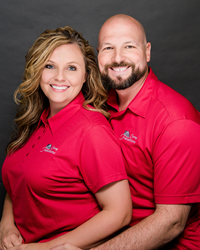 After a combined 33 years in healthcare, Rob and Miranda McClintock are pleased to announce that they are putting their experience to use in a new way through their new business, Caring Transitions of South Central Kentucky. Caring Transitions’ specially-trained team can handle organizing, packing, de-cluttering, moving, resettling, in-person and online estate sales, liquidations, and preparing homes for market. Caring Transitions specializes in managing senior relocations, but the services are also perfect for busy families and individuals in need of assistance. Caring Transitions of South Central Kentucky serves Bowling Green, Franklin, Scottsville, Morgantown, Glasgow, Beaver Dam, Greenville, Leitchfield and the surrounding areas. “Miranda and I have both had long careers in healthcare, so we understand not only the transitions our clients are facing but, in many cases, we have a certain clinical perspective of their needs and the future. I think, especially when we’re working with older adults, our experience will help us help them meet their needs now and then carry them for years to come,” Rob said. Caring Transitions’ services are perfect for managing the many aspects of a senior move or assisting with the process of downsizing to provide a safer living situation as well as for busy families and people clearing out the home of a loved one who has moved into assisted care or has passed. All of Caring Transitions’ services are customizable, so clients only pay for the services they need – whether that means managing the entire move and estate-clearing or just getting someone resettled into their new place. Rob, a U.S. Army veteran, has been an occupational therapy assistant – specifically in geriatrics – for the last 18 years and spent the last 12 years as a rehabilitation director. Miranda has been working as a registered nurse for the last 15 years. Although they both loved caring for patients, they were also ready for a change. Being in healthcare has also helped the McClintocks to be great listeners – a skill they are looking forward to putting to good use with Caring Transitions of South Central Kentucky. Caring Transitions is bonded, insured and their W2 employees have been background checked. For additional information, call (270)715-0208, email RMcClintock(at)CaringTransitions.com or visit http://www.CaringTransitionsSCK.com.